Are you a photographer, professional or amateur, who loves to take pictures of nature, beaches, and the sunset? If not, WHY NOT? That’s besides the point. On the west coast of the Florida peninsula runs a long strip of photogenic beaches on the Gulf of Mexico perfect for sunset photography. Sugary-white sand beach with the calm, sea-blue water offers the best backdrops for an level photographer. The following is a list of hotels directly on the beach with optimum camera positioning. 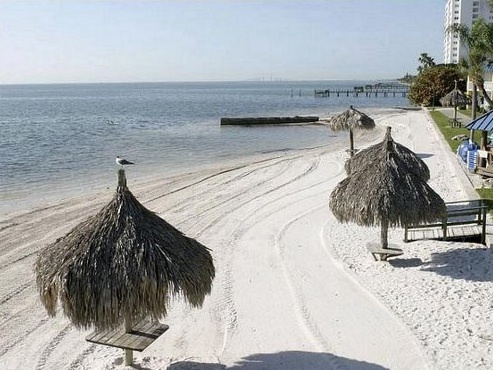 As the photo shows, the Ritz-Carlton is conveniently located directly on the beach. My bets are, with the impeccable service the Ritz provides, you’ll have no problems setting up a private location from which to capture the perfect shot. 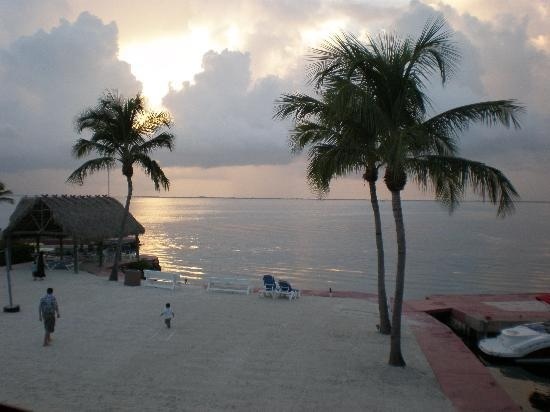 Imagine the foreground of your sunset shots with the palm frond-covered huts shown above. Near perfection, if you want my opinion. Stay at the Holiday Inn St. Petersburg Marina Cove for an affordable rate with the same sugar-white sand and the more expensive hotels. Arguably, one of the world’s most perfect tropical locations, the Florida Keys are home to some of the best photography-taking opportunities in all of Florida. Palm trees on the beach are in abundance as you capture your photograph of the sunset with the perfect silhouette of a sailboat heading out for a night-time cruise. 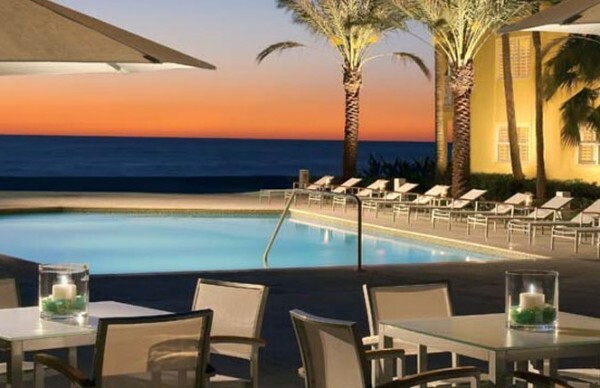 Tropical elegance is the selling point of the Edgewater Beach Hotel in Naples. It’s hard to get closer to the beach than the few steps it takes to make it to the water’s edge. As one of the Waldorf=Astoria’s Collection hotels, top-notch service is worth the visit. Rustic, classic Florida beach hotel is the best way to describe the stay at the Harbour Master Hotel in Cedar Key, Florida. 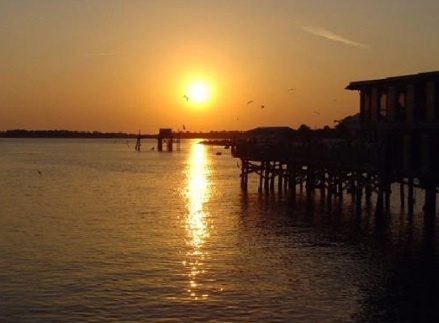 Located on Cedar Key at the boat harbor, you can capture the best of the small-town, Florida flavor with the sunset over the Gulf of Mexico as your backdrop. Want to see Mallorca, Spain from a local’s perspective? 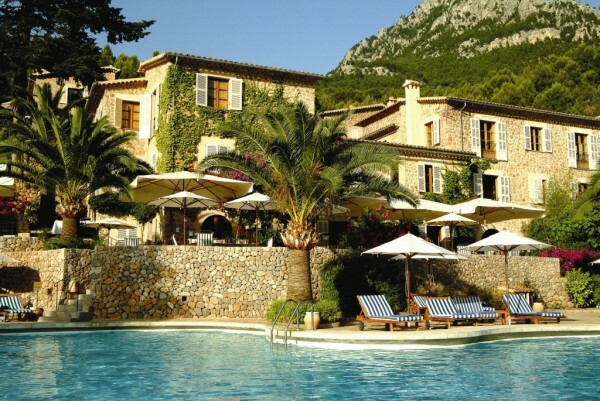 Ask for Pancho, Lluna or Alba during your visit to the Hotel La Residencia, a luxury hotel and spa in Mallorca, Spain. Any of these three guides will take you to the mountains, offering stunning views of the Mediterranean sea below. While they may not speak your language, the guides will carry a gourmet picnic up into the hillside above the historic Mallorcan manor house. That’s right, three donkeys, Pancho and his sisters Lluna and Alba, will carry a gourmet picnic, up the newly constructed nature trial for guests to take in the views of the Tramuntana mountains and the Mediterranean Sea while enjoying lunch above Hotel La Residencia in Mallorca, Spain. 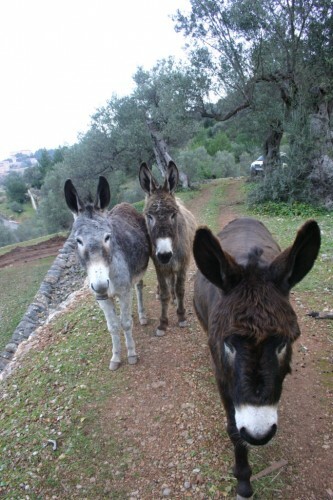 Don’t act so surprised; donkeys have played an important role in Mallorcan life. The sturdy, sure-footed mules have been used to carry goods, as well as cart children, from the villages to the mountain homes on the island of Mallorca. Like many of the Balearic islands, Mallorca is a small Mediterranean island, yet it offers luxury lodging, dining and spa services. For a truly Mallorcan experience, the Hotel La Residencia staff will prepare a picnic of local bread, olive oil, tomatoes, cheese and Mallorca’s cold meats and island sausages. The price of the gourmet picnic, including guide and donkey, is 65 euros, (approximately $88 United States dollars.) Hotel La Residencia is a traditional Mallorcan country manor house designed to combine elegance with romantic seclusion. Overlooking the village of Deia, the 67 room luxury hotel also includes a spa. Room rates at Hotel La Residencia range fro Euro 355 (approximately $478 USD) to Euro 570 (approximately $768 USD) for a standard double room. 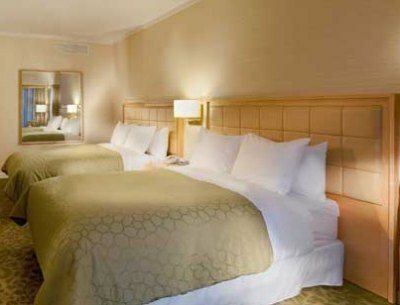 Say the name Four Seasons and elegant and sophisticated lodging comes to mind. Now add the phrase “Silicon Valley” into the mix and the words contemporary, sleek, cutting edge pop to the forefront. Blend the two together and the result is the four year old Four Seasons Silicon Valley at East Palo Alto. A place where movers and shakers come together for meetings, to talk business and yes, to sleep in comfortable beds in well appointed surroundings. The Four Seasons touch is noticed as the bell man opens the door and greets you with a smile as he looks into your eyes. A few steps into the lobby and yet another member of the Four Seasons family welcomes you to the property. By the time I’ve made it to the front check in desk, I’m well into my fourth interaction with another Four Seasons staff member and feeling like a special guest in some one’s home, albeit a very large home. And, being the ever gracious Four Seasons, your well-behaved pets are welcomed with a special doggie amenity. Children are made to feel special, as well, with child sized bathrobes. If you let the hotel know the name of your child, sponges that spell out your child’s name are waiting for them in the bathroom. How cool is that? Feeling left out? The Four Seasons has bathrobes hanging in the bathroom, awaiting your arrival. Don’t forget to set out your shoes for a complimentary shine before you head to the fitness center. Take the elevator to the third floor and head out to the roof top for a dip in the swimming pool or hot tub, before or after your spa visit. I’m a solo guest, as I am joining San Francisco Chronicle Travel Editor Spud Hilton to talk about travel, writing and blogging this evening to the members of Skal San Francisco, an association of travel and tourism professionals. As is typical for me, I have work to be done this evening and appreciate the large, well-lite work space in my deluxe view king room (rates range from $199 weekend to $295 weekday.) Typical of expense account properties, there is an Internet fee of $15 for 24 hours. There is a fee for parking your car, as well; $22 for valet parking, $12 for self parking. 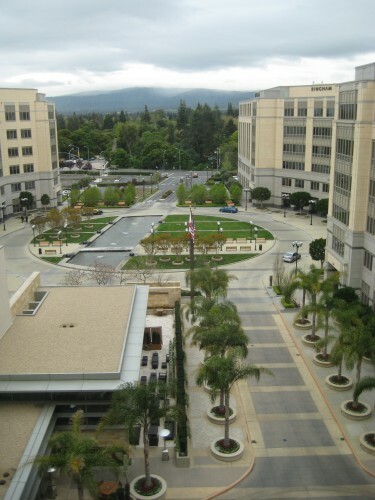 As this Four Seasons is located in East Palo Alto, next to neighbors Stanford University and Facebook, it’s only fitting that this property was the Twitter beta test site for the luxury hotel chain. While @FSPaloAlto was the first Four Seasons property on Twitter, a micro-blogging platform, there are now 20 Four Seasons hotels on Twitter. Follow the Four Seasons on Twitter for restaurant, bar and spa specials or become a Facebook Fan to hear about winemaker dinners and such. Article written by and photos courtesy of Travel Writer Nancy D. Brown of What a Trip I was a guest of the Four Seasons during my stay. While Ojai, California is considered a year-round travel destination, March and October are the best times of year to plan your girlfriend getaway, special celebration or romantic retreat. This March was my first trip to Ojai and I’m already dreaming of my next visit. A walkable hamlet filled with shops, culture and terrific dining, Ojai appears to be a town filled of Los Angeles escapees. The charming Sue Nido Inn - translated to “your nest” in Spanish – served as my private shangri-la for this outdoor adventure weekend. The three year old Su Nido Inn, with nine, one and two bedroom non-smoking suites, was built as a luxury Inn with peace and comfort in mind. The suites feature feather beds, Walker Zanger tile with little mosaic niches throughout the Inn and specially milled carpet. 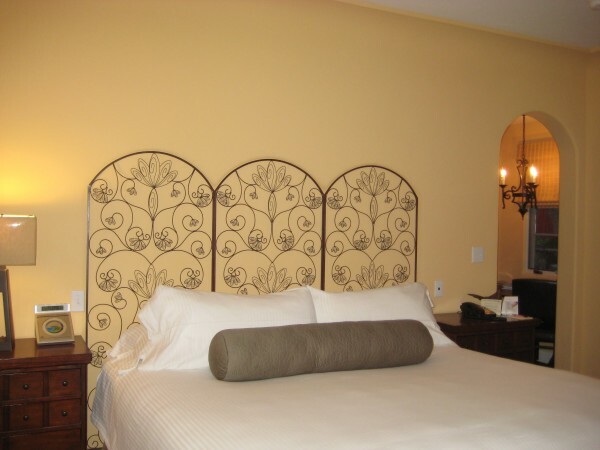 “With our king suite accomodations, we cater to adults,” notes Owner and Ojai resident Geoff Wells. The father of three is quick to point out that their sister property, Casa Ojai Inn, is kid-friendly, with a salt water pool and spa and extended stay rooms available. 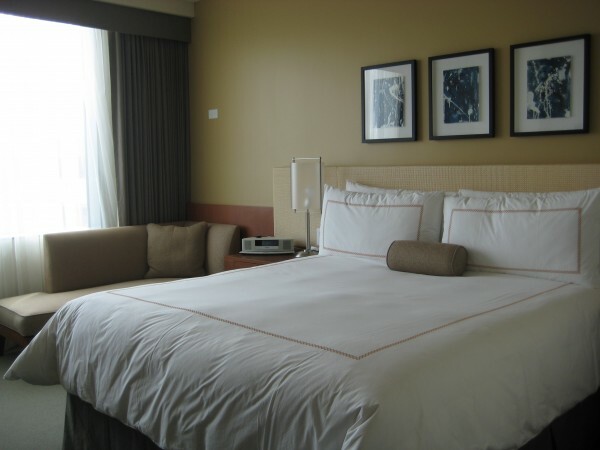 My Su Nido room, the Robin Suite, has a rack rate of $309 on this March weekend and $219 Sunday – Thursday. The Heron Suite, with its own hot tub, is the romance suite, yet all rooms come with fireplaces, mini fridges stocked with complimentary waters and drinks; gourmet snacks and a coffee pot are available, too. While you may appreciate the Molton Brown amenities, I was thankful for the robe and slippers hanging in the closet. I travel carry on whenever possible due to a prior lost luggage situation. Social media geeks will appreciate the free internet. You can also find the Su Nido in on Facebook. 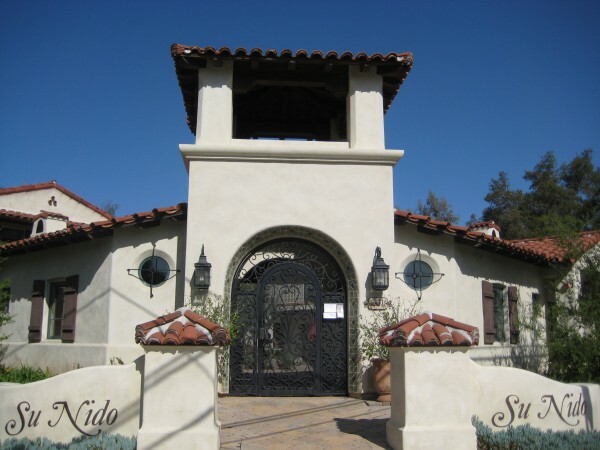 Article written by and photos couresy of Travel Writer Nancy D. Brown of What a Trip I was a guest of Su Nido Inn during my Ojai visit. My brother-in-law and his wife are expecting their first child at the end of May. It’s the first grandchild on both sides, so the whole family is pretty “over the moon” about it. The happy couple have been talking about a different kind of moon — a babymoon, which is an often romantic trip that expectant parents take near the due date (although not too near!) You could call it a last hurrah before the baby arrives and distracts them from everything else, including each other, for the next 18 years. 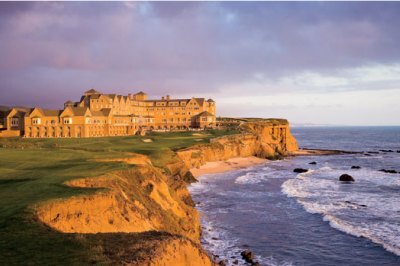 Less than an hour’s drive from San Francisco, this gorgeous property has amazing The Best Service, a breath-taking view, and nightly bag pipes & cocoa ritual at sunset. From the moment you drive up to this resort, which is dramatically perched on a cliff overlooking the Pacific, you feel like you’re a million miles away from every care, worry and concern. Combine a club-level stay with mom-centric pampering like the Mellow Mama massage, which uses “specific pre-natal techniques to increase circulation, alleviate tired muscles and reduce water retention” and you have a perfectly indulgent getaway! For peaceful, contemplative walks in the woods, followed by a relaxing massage, the Ventana Inn & Spa Big Sur Central Coast Resort is a natural choice. The Ventana Inn & Spa is set on 243 acres on the Big Sur coast, the perfect mixture of modern amenities (flat screen tvs) and nature, with guided hiking tours and miles of trails. It’s one of the Joie de Vivre properties, so you know it’s a green property. Plus the boutique chain is noted for its support of local communities, so you can indulge yourself social-guilt-free. 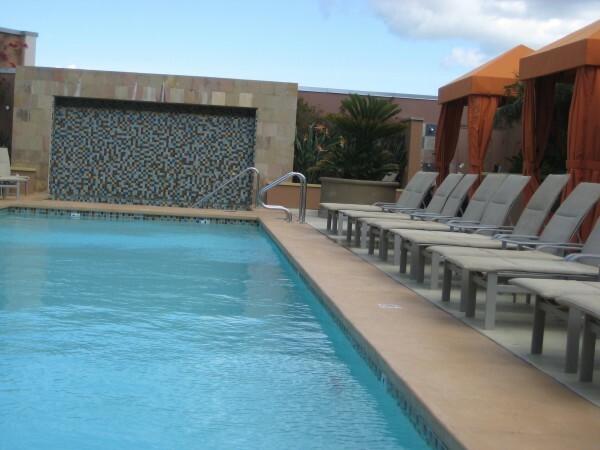 For a waterfront experience with a little more variety of activities away from your room and the property, the newly remodeled Monterey Bay Inn is great option located at the entrance to Cannery Row. It’s close enough to walk to the incredible Monterey Bay Aquarium, but so on top of the nightlife that it will keep you awake. 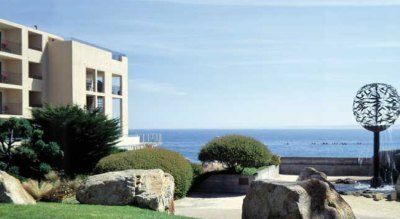 If you’re in the mood for just relaxing, the ocean-side location means your view is the Monterey Bay Marine Sanctuary. Put that together with feather beds, 310 thread-count Pima cotton linens, and (one of my favorite amenities ever, I think all five of the Inns at Monterey do this) fresh baked cookies — plus complimentary breakfast served in your room — means it’s delightful to lounge in your room. And yes, they also offer a pre-natal massage! 20% Savings on Dinner at Roots Restaurant — delicious, cozy, organic! Heading north from San Francisco, you can reach wine country in an hour — less if you have a lead foot and good luck getting past those eagle-eyed Marin County-based CHP units. My friend Sharon highly recommends the Carneros Inn in Napa for a romantic wine country get away, and I’m glad to share the advice. It sounds like a dreamy getaway, even if you’re not doing a lot of wine tasting. Rustic features like a shower that opens up to a secluded patio mixed with luxurious touches, like a heated bathroom floor, are the perfect mix for a couples-centric weekend — it was even named one of the top 25 most romantic getaways in the world by Travel + Leisure! In Santa Fe, New Mexico, Ten Thousand Waves is a slice of heaven. An overnight stay is bliss. Whether you spend your days browsing Santa Fe’s art scene or hitting the slopes skiing, March is a perfect month to take in this outwardly unassuming resort’s Japanese-style offerings. Here is where pampering is done right. 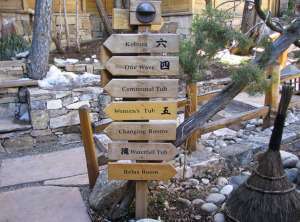 Like the baths, the spa’s lodging blends an aura of Japan with Santa Fe style. For the budget-minded, the artsy Airstream Bambi trailer is cute and cozy. At the end of elegance and upscale are the Emperor’s Court suites. Each suite is unique, but all include a kitchen area, a bedroom, a dining area and a private patio. When I lived in Albuquerque, New Mexico, Ten Thousand Waves was a luxurious treat whether winter snow still clung to the trees or the scents of juniper and pinon wafted in the summer air. Now that I’m living in a part of Ohio where this past February only granted Ohioans one sunny day, Ten Thousand Waves and New Mexico sunshine seem like the perfect answer to the winter blahs. Add in a package deal that includes a massage and a skin treatment and I imagine Ten Thousand Waves right about now would be hard place to leave. I had a hard enough time leaving after my last visit when I was there with friends enjoying one of the private hot tubs large enough for six people. Yep, it’s bliss. By the way, if you do head here for a soak, you only need yourself. Towels, hair dryers, lotion, shampoo, conditioner and a kimono are provided for your use. For a complete price list of all spa offerings, click here. Butte, Montana used to be the most profitable corner of the United States. Wander along the streets of downtown and it’s easy to imagine what Butte was like in its heyday when the The Copper King Mansion became its crown jewel. The mansion, still a jewel, is now a museum and a bed and breakfast. 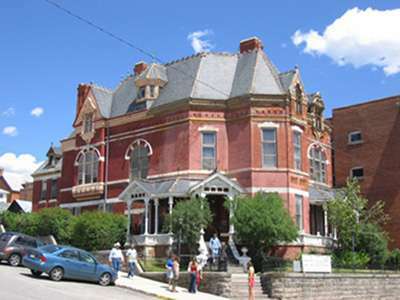 The Copper King Mansion, once the most expensive real estate in Butte. This majestic red brick Victorian-style house gives a nod to the era of Butte’s mining history and the wealth of William Andrews Clark. Clark, who had the mansion built between 1884 and 1888, accrued his fortune when mining boomed in Butte. Clark’s life was recently chronicled in a recent msnbc.com article on his daughter Huegette–a wealthy recluse without any offspring. 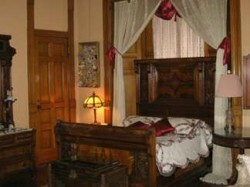 If you stay at the Copper King Mansion Bed and Breakfast, you can stay in Huegette’s room as one choice. The mansion is exquisite. Clark knew art and beauty and made sure he surrounded his family and himself with it. Fortunately, although the family did not stay robust, the mansion remains glorious. It’s one of my favorite stops in Butte when we go there each summer. As a guest of the bed and breakfast, you can take a guided tour of the rest of the house for free. Here is an opportunity to be part of an unusual slice of American history while basking in beauty. Perhaps some of Clark’s money making smarts will rub off when you slumber. The master bedroom suite is one of the overnight options. In addition to the Copper King Mansion, there’s plenty to see in Butte and it remains one of my favorite destinations. The Baur au Lac Hotel in Zurich Switzerland has recently renovated it's rooms. Baur au Lac is a high quality hotel with the guest in mind. On the shore of Lake Zurich in it’s very own private park, this hotel is a member of “The Leading Hotels of the World” and of “Swiss Deluxe Hotels” and lives up to it’s name in service and food. The rooms are recently renovated and spacious, decorated in various styles throughout. Hotel du Theatre boasts the La Suite Lounge on the first floor as the “perfect meeting place for moviegoers.” Now they serve Tapas for before or after the theatre. YUM. Hotel St. Gotthard has been open since 1889 and is now on it’s 4th generation of owners. This luxurious legend is high in class and located in the heart of the city center. Enjoy the lobster and oyster bar/restaurant or the Piano Lobby Bar/Restaurant or the canopied pavement café for a light meal. The Ritz-Carlton, Sarasota might never have existed if members of high society in Tarpon Springs, Florida had welcomed John and Mabel Ringling. Instead,when they were snubbed, the Ringlings moved further south to the then quiet fishing village of Sarasota. Captivated by Sarasota’s sparkling bay and quaint fishing village, the Ringlings put their substantial wealth to work transforming the city into a showcase, determined to be remembered for more than their Ringling Bros. Barnum and Bailey Circus empire. They built their personal home, Ca ‘d Zahn, on the shores of the bay, modeling it after an Italianate Gothic palace and filling it with European art. When they ran out of room in the 31-room mansion, the Ringlings built the John and Mabel Ringling Museum of Art, creating one of the world’s finest collections of European paintings and sculptures by the great Old Masters. Shortly after completing their home, John Ringling decided that Sarasota, blessed with natural beauty and some of the world’s most stunning beaches, could be better promoted if the city had an upscale resort. He agreed to pay his good friend and business associate, Albert Keller of the New York Ritz-Carlton, $5,000 per year to use the prestigious name and began building on the southern end of Longboat Key. A few short months later, after lavishing hundreds of thousands of dollars on construction, the Florida Land Bust and Great Depression forced Ringling to shut down the project, leaving the partially completed 250-room hotel to stand like a skeleton until 1960, when it was finally razed. Nearly 75 years later, Ringling’s dream of a luxury hotel was finally realized when the Ritz-Carlton, Sarasota was constructed on a parcel of land overlooking the glistening bay the Ringlings had so loved. In homage to the Ringlings, the resort features European touches that include an entryway of patterned Italian and Spanish marble in shades of gold, green, terra cotta, ivory, and khaki; fabrics that were custom-made in Italy; and decorative scrollwork, flourishes, and intricate borders in rich jewel colors. Iron light fixtures with multi-colored crystals, gold patterned hand-loomed carpets, and antique ceramic Italian urns complement oil portraits and landscapes by European masters that dot the walls throughout the property. The extravagance of the common areas extends to the guest rooms, which are painted in delicate moss green, deep coral, or warm cinnamon and accented with rich fabrics and furnishings. Every room features featherbeds, feather duvets, and goose down pillows; Egyptian cotton linens and Italian wool throw blankets; and marble-trimmed bathrooms. Touches like gourmet coffee and tea presentation, Bulgari bath essentials, and plush terry bathrobes and slippers round out the luxury experience that defines The Ritz-Carlton. Prices for a city-view guest room with one king or two double beds and a private balcony begin at $331 per night in high season. Getting away for the weekend with your partner can be a challenge, so when you get the chance, you better do it right. The Encore Las Vegas is a luxury hotel with all the amenities you’d need for a romantic weekend together. Located next door to the flagship property, Wynn Las Vegas, Encore offers luxury furnishings and top-quality guest services. The newly crowned AAA Five-Diamond Hotel features Floor-to-ceiling windows frame the guest rooms with European linens, large-screen televisions, and 700+ square feet of comfort. The Romantic Retreat package at the Encore Las Vegas includes a 2-night stay in a resort suite king at the hotel, a prix-fixe dinner at Stratta at Wynn Las Vegas, and two premium tickets to Cirque du Soleil’s Le Reve. From $339/night, the package is an inclusive deal for the couple who needs a refresher with one another in luxury. Amenities on site include a full casino, full-size salon and spa, shopping mall, and some of the best restaurants in Las Vegas. Tapas at Bilbao Berria Barcelona – Say That 3X Fast!